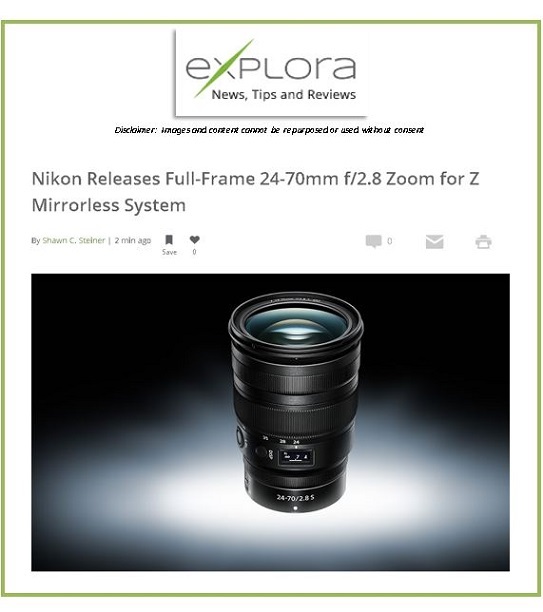 I first noticed the problem using a Sigma 35mm f/1.4 lens on a Nikon D750. I was attempting to do an overhead shot by extending the camera above me and composing in the live view screen when I noticed that the lens would not autofocus. I had to resort to using a ladder and the viewfinder to take the picture. Later I tried the lens with my D810 and the same thing happened -- no autofocus in live view. After a quick internet search I found that this was a common issue with using the older Sigma lens on the newer Nikon cameras. Sigma had no way of knowing in advance what changes Nikon would be making in its future cameras when my 35mm lens was made. 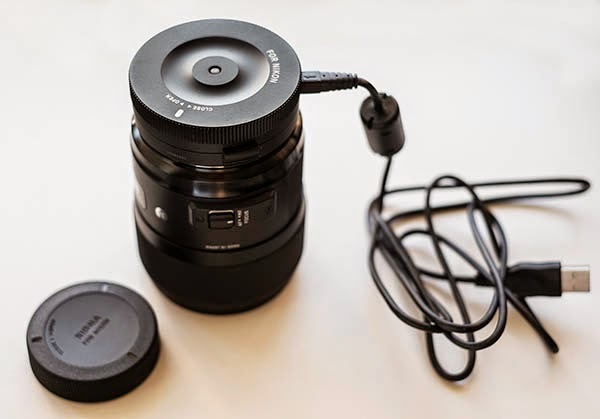 Fortunately, Sigma covered its bases by also introducing the USB lens Dock to allow firmware updates to its lenses. The Sigma USB dock is simple to use for a firmware update. First you need to download the Sigma Optimization Pro software onto your computer from the Sigma-Global web site. Once the software program is installed, mount the USB puck on the lens in place of the rear lens cap, plug the USB cord into the puck and then into the computer and start the software. 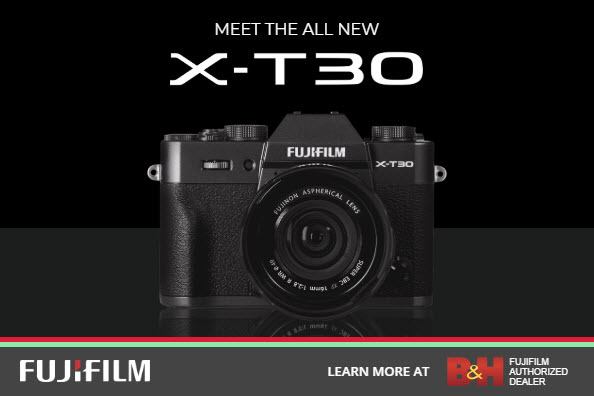 The software will find the lens and see if a firmware update is available. For my Sigma 35mm lens, once the firmware was updated the lens autofocus worked perfectly on the D750 and D810. As an added bonus, the software also allows customization of the lens Autofocus, OS, and focus. 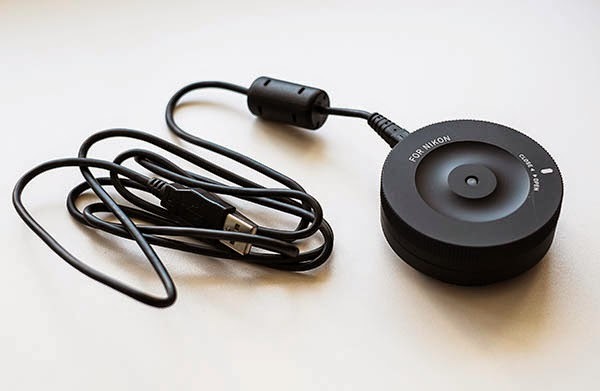 The Sigma USB dock replaces the rear lens cap. 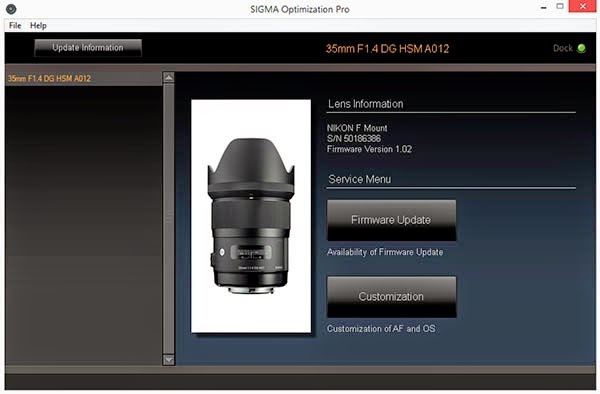 The Sigma Optimization Pro software will find the attached lens and suggest a firmware update if one is available.